2005-06 TheChicago Six, The Art Center, Highland Park, Il. 2005-06 The Art of the Bookplate, Printworks Gallery, Chicago, Il. 1988 Seascapes, Frick Gallery, Belfast, Me. 1952 School of the Art Institute of Chicago, M.F.A. 1951 School of the Art Institute of Chicago, B.F.A. Born in Buffalo, New York, Ad Reinhardt was an early exponent of Minimal Art and a prominent figure in the New York contemporary art scene. His commitment to painting was purely to the process of painting, and he is best remembered for his all-black, large-scale paintings of the 1960s. Before the early 1950s the career of Ad Reinhardt was a long process of emptying out elements from his art. His first nearly monochromatic paintings were blue or red; then beginning in 1954 he painted nothing but black paintings. Both his life and work lead up to these great pictures, his “ultimates,” as he called them. As a young man, Ad Reinhardt studied art history at Columbia University where he edited the humor magazine and wrestled. He also attended the National Academy of Design, the American Artists’ School, and the Institute of Fine Arts of New York University. In 1937, he joined the American Abstract Artists group and from 1936 to 1941 worked for the WPA on the Federal Art Project in the Easel Division, painting in realist style typical of the 1930s. 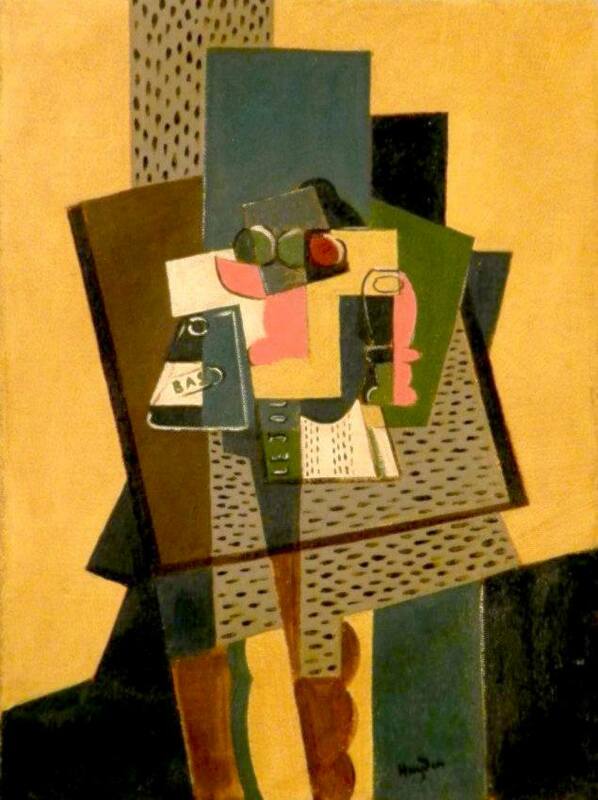 However, at the same time, he did collages and Cubist paintings with hard-edge, flat planes of color. In the 1940s, after serving in the U.S. Navy as a photographer from 1944 to 1945, Reinhardt created numerous cartoons satirical of the art world and became associated with Abstract Expressionism, adopting the method of painting all over the canvas in a uniform, monochromatic way. 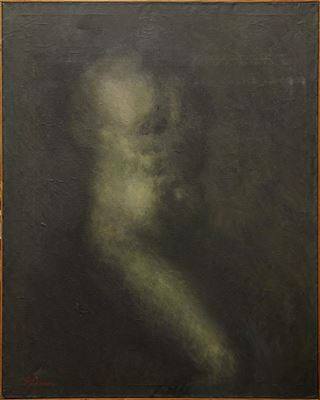 As he got older, his painting became darker and more austere and geometric forms were barely distinguishable from the background. In addition to painting, Reinhardt was an art educator who conducted classes at Brooklyn College in 1947, the California School of Fine Arts in 1950, University of Wyoming in 1951, Yale University from 1952 to 1953, New York University in 1955, Syracuse University in 1951 and Hunter College in 1960. Reinhardt maintained an ongoing interest in Asian Art. He was a member of the Asian Art Association and the Chinese Art Society and gave lectures on Asian Art. He died in New York City on August 30, 1967 at the peak of his career. Adolf Frederick (Ad) Reinhardt was born the son of immigrants, in Buffalo, New York on December 24, 1913. He studied art history at Columbia University, where he edited the humor magazine and wrestled. He attended the National Academy of Design, the American Artists’ School and the Institute of Fine Arts of New York University. In 1937, he joined the American Abstract Artists group, beginning his career as an artist in typical 1930s fashion as an easel painter on the Federal Art Project. He also did collages and Cubist paintings with hard-edge, flat planes of color. Reinhardt dismissed Thomas Hart Benton as an inconsequential ear of corn, Jackson Pollock as an obscure leaf on the tree of art, etc. Not surprisingly, Reinhardt was a controversial figure. Before the early 1950s his career was a long process of emptying out elements from his art. 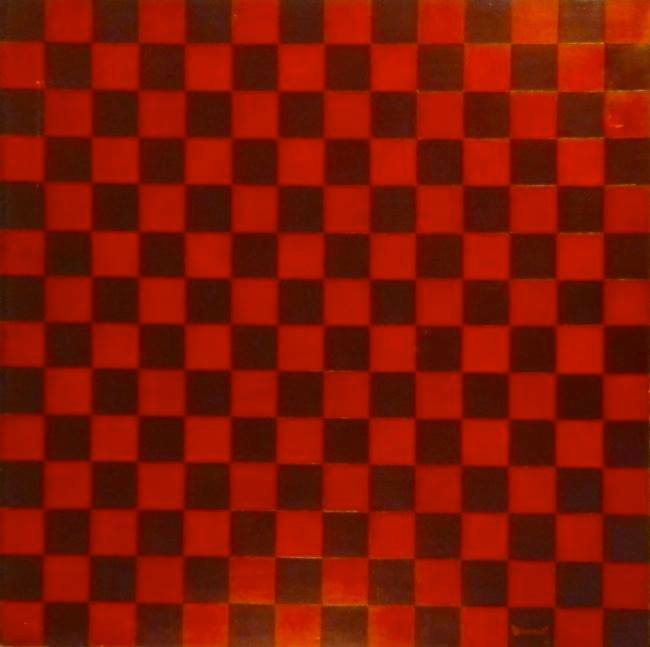 The first nearly monochromatic paintings were blue or red, then beginning in 1954 he painted nothing but black paintings. Both his life and work lead up to these great pictures, his “ultimates,” as he called them. He died at his peak in New York City on August 30, 1967. Henri Hayden was born into a family of wine merchants . In 1902, under parental pressure he entered the Warsaw University of Technology ; parallel , he enrolled at the School of Fine Arts in Warsaw where he quickly considered a brilliant student. With financial help from his father he spent a year in Paris in 1907 , the year Des Demoiselles d’Avignon by Picasso and will not return to Poland. Hayden holds a workshop Boulevard Saint -Michel and leads a solitary and independent life . In 1908 , he attended La Palette , painting academy where Charles and Georges Guérin Devaslière teach. It refers firstly to Gauguin he discovers through Wladyslaw Slewinski during his frequent trips to Britain. In Montparnasse he met key stakeholders including Juan Gris Cubist movement , Pablo Picasso, Jacques Lipchitz and Jean Metzinger . H.ayden exhibits regularly . Constructs and synthetic landscapes he performs are an echo of the painting at the School of Pont- Aven . In 1912, Hayden finds strong support in the art of Cézanne and measured that will guide the voice of Cubism. In 1914 , he signed a contract with Léonce Rosenberg and merchant Charles Malpel . Passionate about music, he attends the Group of Six and illustrates Erik Satie program the first hearing of “Songs pear-shaped .” During the war he fled to Mougins where he met Robert Delaunay then Roussillon apartment and befriends Samuel Beckett. In 1944 , back in Paris , Hayden finds his shop looted. During the last twenty years of his life , painting Hayden ‘s been many exhibitions in Paris , Dublin, Lyon , Caen, Amiens , Aix -en -Provence. In 1953, Hayden stands all references that haunt his painting and becomes figurative . (Source : Nadine Nieszawer , Marie Boye , Paul Fogel , Painters Jews in Paris 1905-1939 Paris School Editons Denoël 2000).